Spray 12 count muffin tin with nonstick cooking spray. In a large mixing bowl, stir together flour, sugar, baking powder and salt. Make a well in the center. In a 1 cup measure, dissolve coffee granules in coffee liqueur and whiskey. Add enough milk to measure 1 cup. Add beaten egg and melted butter to coffee-milk mixture. Whisk to blend. Gently stir liquid into dry ingredients just until moistened; batter will be lumpy. Spoon a little less than 1/3 cup of batter into each muffin cup. Sprinkle 2 tsps turbinado sugar over each batter filled cup. Bake 18 minutes, or until the top springs back when gently touched. 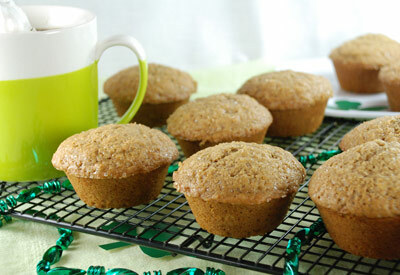 Let rest a couple of minutes before removing muffins from tin and cooling on a baking rack.